NASA Telescopes Join Forces to Observe Unprecedented Explosion. NASA’s Swift, Hubble Space Telescope and Chandra X-ray Observatory have teamed up to study one of the most puzzling cosmic blasts yet observed. More than a week later, high-energy radiation continues to brighten and fade from its location. 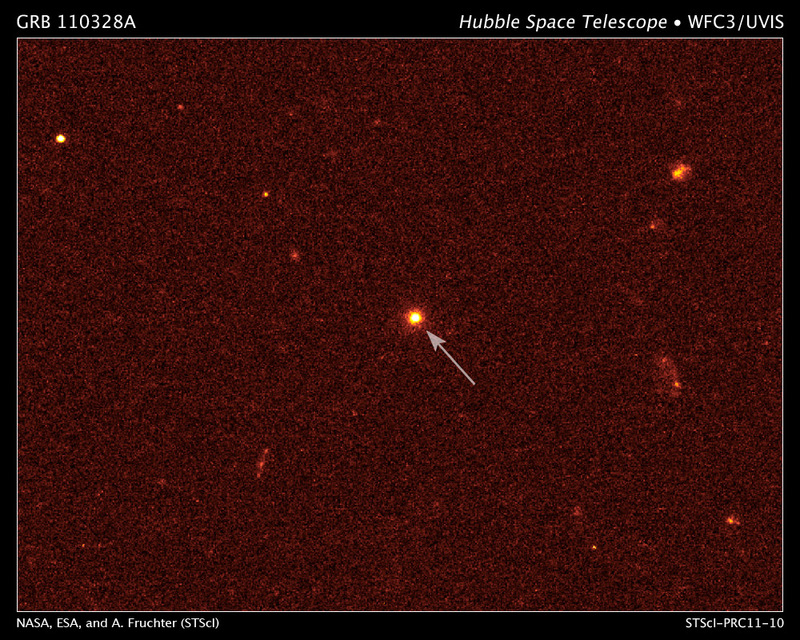 Astronomers say they have never seen anything this bright, long-lasting and variable before. 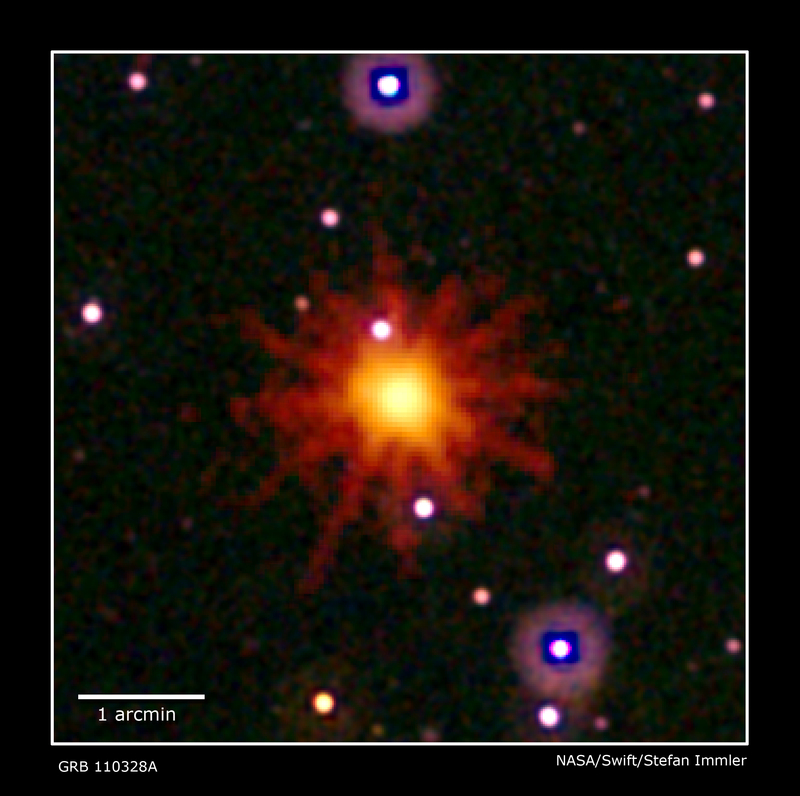 Images from Swift's Ultraviolet/Optical (white, purple) and X-ray telescopes (yellow and red) were combined in this view of GRB 110328A. Currently, astronomers believe a star wandered too close to its own galaxies central black hole which created the unusual blast. Gas is continuing to stream toward the hole. The black hole might have formed an outflowing jet along its rotational axis. When the jet is pointed towards us you can see the X-rays and gamma rays. Research is still ongoing. Swift’s Burst Alert Telescope discovered the source coming from Draco when it erupted on March 28th. Astronomers were informed worldwide. An image taken by Hubble on April 4th finds the source of the explosion in the center of a galaxy that is 3.8 billion light years away. That same day, astronomers used NASA’s Chandra X-ray Observatory to make a four-hour-long exposure of the puzzling source. Most galaxies, including our own, contain central black holes with millions of times the sun’s mass; those in the largest galaxies can be a thousand times larger. The disrupted star probably succumbed to a black hole less massive than the Milky Way‘s, which has a mass four million times that of our sun. 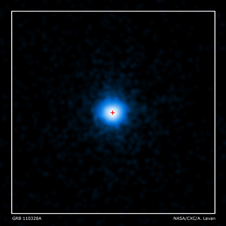 Astronomers plan additional Hubble observations to see if the galaxy’s core changes brightness. Use Your Outside Voice | The Nature Conservancy. More information at the above link. The spending bill passed by the U.S. House of Representatives disproportionately cuts conservation programs by 90-100%. While conservation and environmental programs should shoulder a fair portion of the burden of the budget reductions needed to reduce our national debt, disproportionate cuts run counter to America’s long bi-partisan tradition of protecting land and water for people and nature. These are programs that protect the health and safety of the water we drink, the food we eat, the air we breathe and habitat for America’s plants and animals. These are the programs that protect our national parks and landmarks, our national wildlife areas, our coasts and waterways. There is another link on the page that will give you information on how you can take action by calling and mailing your Representative. There is a sample letter in case you are not used to having to write letters about saving things in this world you are passionate about. Now is as good a time as any! !